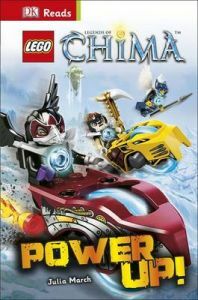 Buy Books Online > Educational: English language: readers & reading schemes > Lego Legends of Chima Power Up! New guided reading series from DK designed to help kids learn how to read and learn to love reading LEGO[registered] Legends of Chima[trademark]: Power Up! is a 'Starting to Read Alone' reader, a perfect short story for kids who are beginning to read for meaning, decoding and recognising words, and enjoying reading. It's time to power up CHI as the Tribes of Chima face new dangers and enemies! Meet new characters and join familiar faces like Laval the Lion and Cragger on their adventures, and learn all about the incredible power of CHI. LEGO Legends of Chima: Power Up! is part of the new DK Reads series, with three reading levels that help children become confident readers. DK Reads is created in consultation with literacy experts and adheres to leveled reading scheme guidelines so the grammar, vocabulary, and content are spot on for each stage. This short story for kids features LEGO Legends of Chima and is packed with illustrated adventures and your favourite Chima characters.